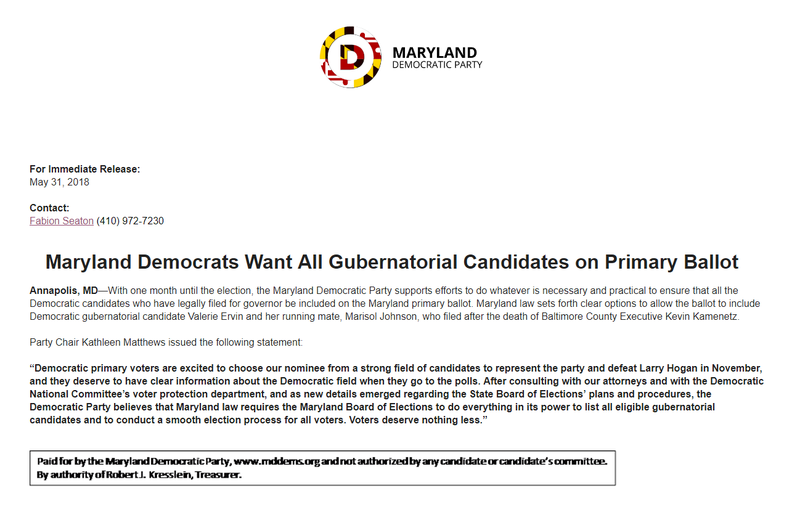 The Maryland Democratic Party has issued a press release supporting gubernatorial candidate Valerie Ervin’s effort to be included on the ballot. We reprint the release below. Maryland is a majority Democratic state. So one would expect that in financial competition between the two state parties, the Democrats would blow the Republicans away. That may have been the case a few years ago, but not anymore. In Maryland, the two state parties have two campaign accounts each: a federal account used for promoting federal candidates and a state account used for promoting state and county candidates. Contributions to the federal account are regulated by federal election law while contributions to the state account are regulated by state election law. Both federal and state money can be used for purposes like paying staff, voter registration and voter turnout so there is a bit of flexibility in use. There are a few local party accounts but they are dwarfed by the state parties. 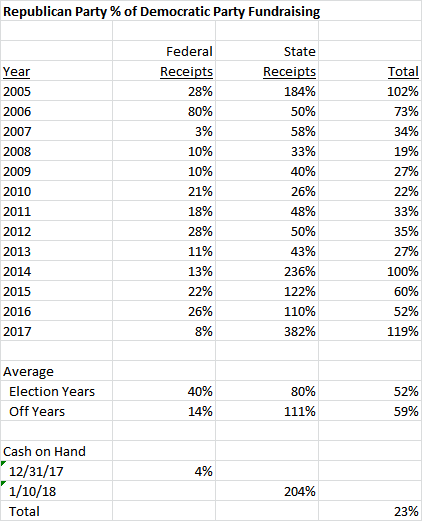 Below is the distribution of federal and state fundraising for the Democratic State Central Committee of Maryland. A few things stand out. First, because there are many Democratic federal elected officials, federal fundraising often exceeds state fundraising. 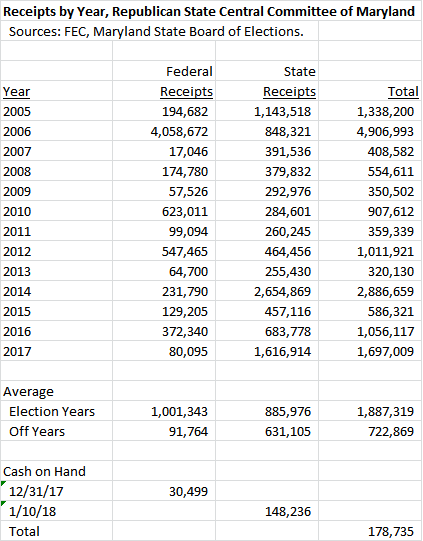 Second, election year receipts are far greater than off-year receipts. Third, the presence of a Democratic Governor and/or a marquee federal race (like the 2006 U.S. Senate contest between Ben Cardin and Michael Steele) is good for fundraising. In 2017, the first year for current Democratic Chair Kathleen Matthews, the party exceeded its off-year pace in federal money but slightly lagged its typical state fundraising. Still, despite not having the Governor’s seat, the party did pretty well and finished 2017 with almost $800,000 in the bank. 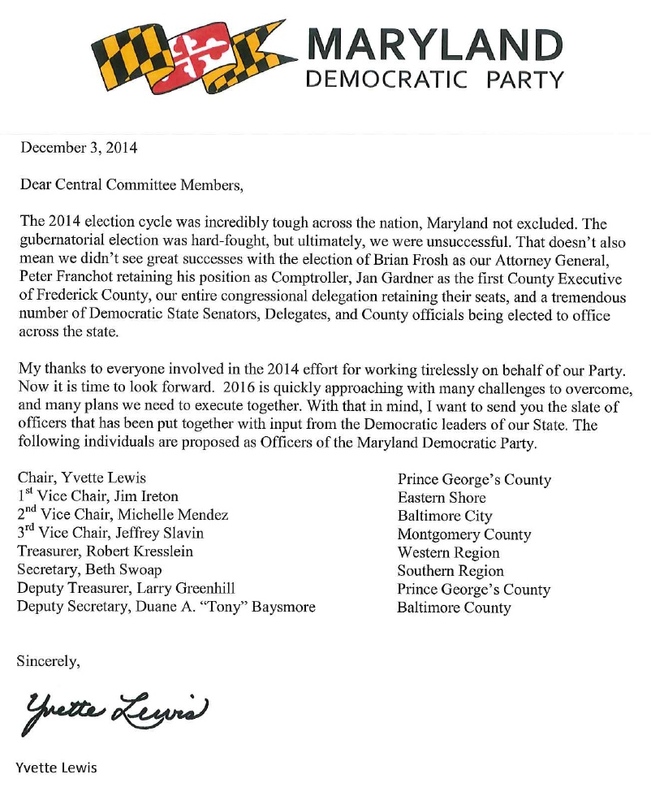 Below is the same information for the Republican State Central Committee of Maryland. The GOP’s federal fundraising is often puny due to its lack of federal elected officials. (The 2006 race involving Michael Steele was a big exception.) But in state money, the Republicans do better than the Democrats when they have an incumbent Governor. They have led the Democrats in state fundraising four years in a row and exceeded them in total money raised in 2005, 2014 and 2017. 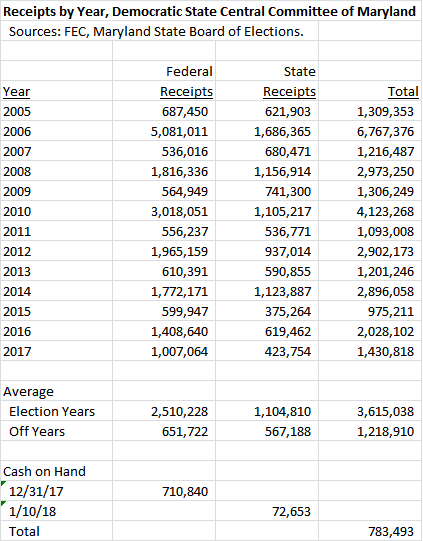 Their total cash on hand at the end of 2017 was about a quarter of the Democrats. The chart below shows GOP fundraising as a percentage of the Democrats. Again, notice how the last four years stand out in how the Republicans have exceeded the Democrats in state-level fundraising. The Democrats’ advantage in federal fundraising can be used for staff and voter activity but it cannot be used to directly promote the party’s gubernatorial nominee in the coming election. Governor Larry Hogan will have an enormous financial advantage against whoever wins the Democratic nomination and the two parties could be at rough parity. If Hogan wins, it’s reasonable to assume that the GOP will continue to raise as much or more in state-level money as the Democrats during his second term. That would be a nice boost for the next generation of Republicans looking to succeed him. 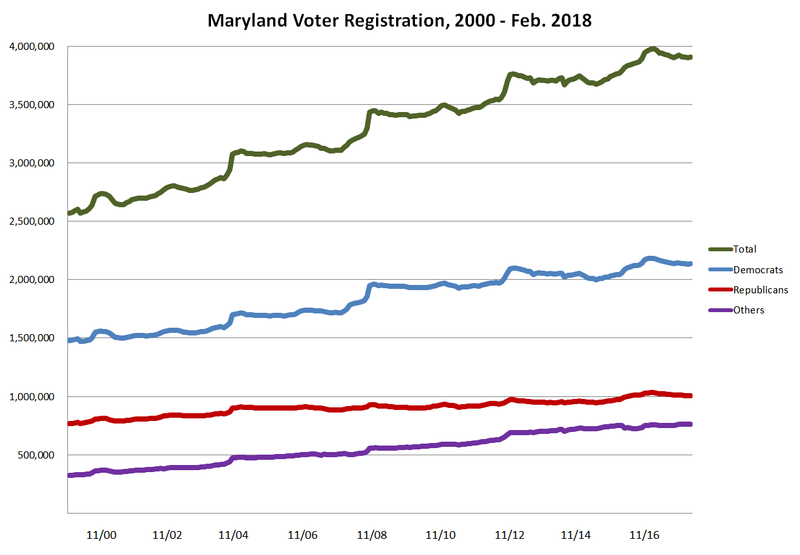 Despite a wave of anti-Trump activism from the left, Democratic voter registration in Maryland has actually fallen since the President’s election in November 2016. Is that a problem? To answer that question, let’s start with this fact: since November 2016, voter registration among Maryland Democrats has dropped from 2,179,948 to 2,134,776 in February 2018. That’s a decline of 2%. Over the same period, voter registration has dropped by 2% among Republicans, risen by 2% among independents and other party members and declined 1% overall. The state’s voter registration numbers go back to 2000. Over that period, while registration has risen generally, it is tied to election cycles. After each general election, registration drops, but then begins rising prior to the next general election. The chart below shows that pattern clearly for all categories of voters. Each election cycle has seen an inflection point, a month in which registration has stopped falling and started rising steadily through the next general election. Over the last four presidential cycles, the inflection point has occurred on average fifteen months before the general election. Over the last four gubernatorial cycles, the inflection point has occurred on average eight months before the general election. Here are the registration gains by category from average inflection point to general election in each of those cycles. A few things stand out. 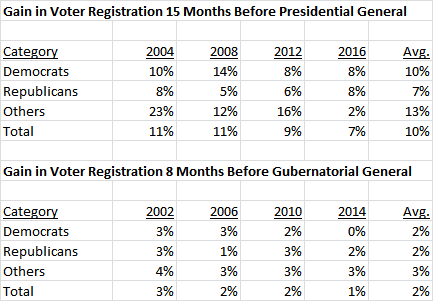 First, registration gains are far higher in presidential cycles than in gubernatorial cycles. Second, the long-term trend in both kinds of cycles is decline in the rate of gain. Third, a sharp fall in registration gains among non-Democrats and non-Republicans in the 2016 cycle may reflect significant discontent with the two major party nominees. And fourth and most relevant, flat-lining Democratic registration may have been a portent of Anthony Brown’s loss in 2014. What is happening now? Our latest data point is February 2018, fifteen months after the 2016 general election. We compared voter registration gains from the last presidential election to fifteen months later over the last five cycles to put the last fifteen months in perspective. Overall, it’s normal for registration to fall over that period of time. On average, registration is down 2% for Democrats and Republicans, up 2% for others and down 1% overall for those 15-month periods. From November 2016 through February 2018, voter registration fell among Democrats and Republicans by 2%, rose among independents and other party members by 2%, and fell for all voters by 1%. These are the exact same rates as the average for the last five cycles. This goes against the prevailing narrative that President Trump’s conduct in office is producing a revival of the Democratic Party. It’s true that Democrats have put together a string of special election wins around the country and many analysts are predicting that they might take over one or both chambers in Congress. It’s also true that changes in registration don’t always correspond to changes in actual voting. But in Maryland, at least on the measure of voter registration, Democrats have not appeared to capitalize on anti-Trumpism to bolster their ranks. Voter registration trends are behaving normally, not abnormally as one might expect in the age of resistance to Trump. This is good news for Governor Larry Hogan. As for Maryland Democrats, perhaps questions should be asked. In the final days of the gubernatorial campaign, attention is rightly being focused on Republican Nominee Larry Hogan’s refusal to release his responses to the NRA questionnaire on this issue. A good question: candidates should be prepared to share their views not just with special interest groups but the general public. ANNAPOLIS, MD – Last night, reports across the state confirmed that the National Rifle Association is opening up their wallet to defend their endorsed candidate for Governor, Republican Larry Hogan. The robocall says that “there’s only one candidate in the race for governor of Maryland who has stood strong against the Obama Bloomberg gun control agenda, that candidate is Larry Hogan.” It goes on to attack Lt. Governor Brown because he “helped to enact one of the largest gun bans in the history of Maryland” – the ban on the sale of assault rifles contained in SB 281. Larry Hogan, who filled out the NRA’s questionnaire, earned an A- rating, and was recently endorsed by the NRA, has continually refused to release the promises he put in writing to gun lobbyists. You can listen to the NRA’s pro-Hogan robocall by clicking here.